(CelebrityAccess MediaWire) — Macomb County, Michigan, plans to raise it rates and pocket all proceeds for parking at county-sponsored events at the Freedom Hill Amphitheatre this year. 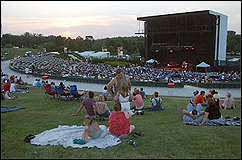 For the past five years, Macomb County has relied on Hillside Productions Inc., which operates the venue at the county-owned Freedom Hill County Park, to collect parking fees during county events. As compensation, Hillside kept 75 percent of the parking revenues at county events such as Harley Fest, and the Italian and Polish festivals. This week, Macomb County took a stand when the Parks Commission voted unanimously for the rate increase and a new method of collecting the money. A Hillside spokesman told the paper that company officials were “shocked” by the commission’s decision to treat county-sponsored events differently from shows at the amphitheater, since all parking revenues have historically been pooled together, and split the same way for years. Hillside has recently entered into an agreement with Palace Sports & Entertainment to create a single management group for the theater, but the deal will not be finalized until the new company, PSE Hillside, receives approval for a liquor license.